In large bowl, combine cereals. Add marshmallows; toss to mix. Spread mixture on sheet of waxed paper. In small microwavable bowl, microwave chocolate chips on Medium (50%) 1 minute. Stir until chips are melted and mixture is smooth. If needed, microwave 15 to 30 seconds longer on Medium. 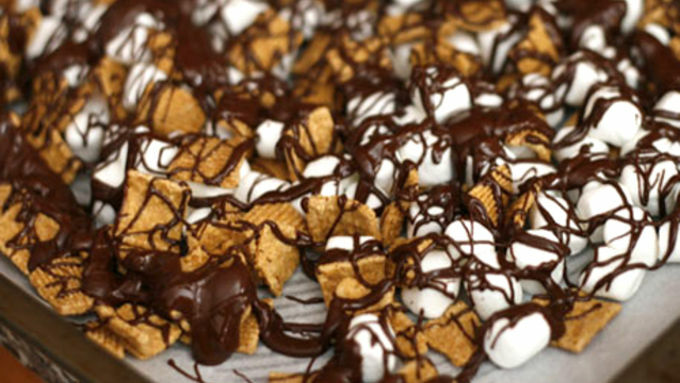 Using spoon or fork, drizzle melted chocolate over cereal-marshmallow mixture. Let stand about 1 hour or until chocolate is set. Winter in the Northeast this year has been … snowy. Truth be told, we haven’t seen any patch of lawn since Christmas, and despite the warming temperatures, we remain buried under so much snow that it feels like we'll be tossing ice melt in July. Summertime seems so very, very far away right now. So, anything that can give us a hint of summertime? It’s very, very welcome. And one of my favorite treats during summer is s’mores. 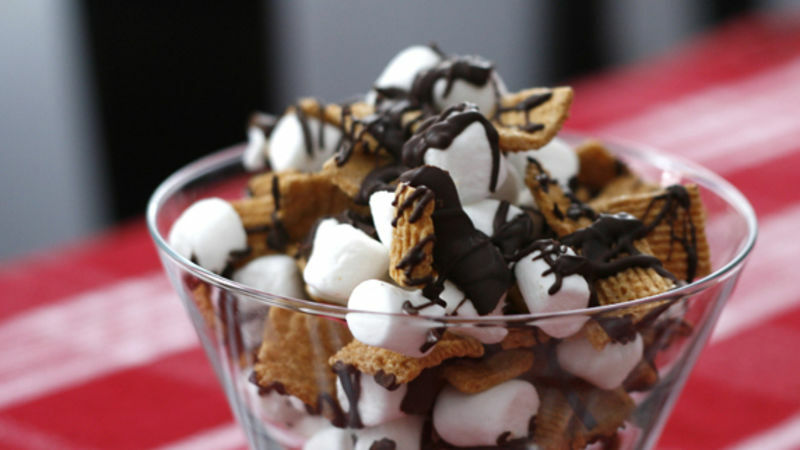 I came up with the idea for this S’mores Snack Mix on a particularly snowy day, when I was daydreaming about our summer camping trips (ok, they are more like glamping). S’mores sounded so inviting … This version is easy to make at home – and it’s fabulous to have your kids help you with. They can do much of the mixing and stirring, making them feel more like this snack is something they did themselves.